Blending elements of art, science and technology, alumni are using out-of-the-box, interdisciplinary thinking to make new discoveries. Peggy Rouh had worked for IBM for 17 years when she decided to pursue her master's degree. Alhaji Saccoh ('10) raises money and donates supplies to his native country. This spring, I had the honor of attending my granddaughter Lauren's graduation ceremony. UNT's new state-of-the-art facility offers students a place to wind down and study up. UNT is focused on "stretch" goals to firmly establish itself as a top-tier research university. Alumni are part of a booming industry of winemakers and brewers who are growing and going local. A beloved Distinguished Alumna has achieved legendary success setting her own course. The 2016 Summer Olympics in Rio continues a long line of UNT connections to the games. This summer, UNT and the Dallas Cowboys teamed up to offer students new academic experiences. Shawna Thomas ('99 TAMS) was always intrigued by the news. UNT welcomes one of its largest and most diverse freshman classes to campus. Diedrick Brackens ('11) combines the South, West Africa and Europe in his work. UNT named a Bee Campus USA and student crowned Miss Texas International. Carmen Cusack, a former student in the College of Music, earns a Tony nomination. How can you plan a successful special event? Wren Baker joins UNT as vice president and director of athletics. Finley Graves travels to China for a historic trip to bestow degrees on four undergraduates. I left Denton in 1990. After 25 years, finally I had a chance in February to return to campus. The UNT Alumni Association continues to add more opportunities for alumni to network this fall. Watch Soar to New Heights at UNT to see why UNT is home to excellence the size of Texas. 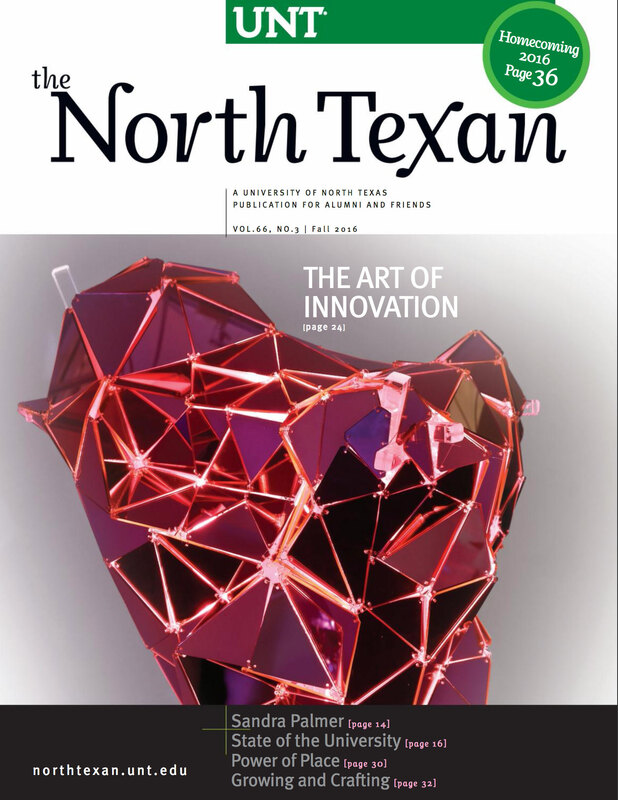 I read your article about UNT people working to keep North Texas healthy (summer 2016). Throwback: Students line up to register for classes in 1971.